Cardo Systems, Inc., the world’s market leader in wireless Bluetooth® communication systems for motorcycle helmets, today announced that it presented the racers competing at this past weekend’s exciting MotoGP in Indianapolis with its industry-leading scala rider G4 PowerSet motorcycle intercom communication system for bikers. The most feature-rich communication system of its kind, Cardo Systems’ scala rider G4 PowerSet provides full duplex wireless intercom communication up to ONE mile* among two bikers, three bikers or four-way communication among two bikers and two passengers on two bikes-an industry standard. The highly acclaimed communication system contains two factory paired scala rider G4 Bluetooth headsets for immediate motorcycle intercom use. In addition to intercom communication, each scala rider® G4 can connect with virtually any portable Bluetooth device including mobile phones, MP3 players and compatible GPS units (for in-helmet voice instructions). It can also connect with non-Bluetooth MP3 players and GPS units via its embedded jack, and the entire line of scala rider headsets. Both can transmit STEREO music from any MP3 player with A2DP capability. Established in 1949 as a world championship by the Fédération Internationale de Motocyclisme (FIM), MotoGP is the premier motorcycle racing world championship, an 18-race series visiting 14 countries across four continents. Its participants represent the world’s most-skilled racers. Last weekend’s Indianapolis leg of this prestigious global event showcased the natural synergy between FIM and Cardo Systems, both marquee names in the motorcycle industry. Cardo Systems was happy to provide them with the industry’s pre-eminent Bluetooth® communication device in recognition of their world-class status in competing in last weekend’s Indianapolis event. Compatible with virtually all motorcycle helmets, the scala rider G4 PowerSet is available with noise-canceling microphones for the highest communication quality. The device’s rechargeable li-polymer batteries allow for up to 10 hours of talk-time and 7-days standby time. The scala rider G4 PowerSet is available through select distributors, retail outlets, specialty motorcycle shops and directly from the Cardo Systems web site at www.cardosystems.com with a suggested retail price of $489.95 USD. *results may vary according to terrain. The first annual PEI - "Red Island Run" took place this past weekend in beautiful Prince Edward Island and it seems to have been a success; though there's not much in the news yet or on the Red Island Run website. I haven't seen reports of actual numbers of attendees yet but organizers were said to be expecting 1500 people. So, if you were there send us some pictures or information about the event! Finally, your wish to have a bike like Batman have become possible. Dave Welch of Chopper City USA has created a replica that's street legal. I'm sure it handles the twisties like a dream with those two 'giant' tires! Definitely a more upright position than the movie version. Here's a video clip of the the BATMAN Bat-Pod from the BATMAN movie (The Dark Knight) built by Dave Welch of www.choppercityusa.com. Hold onto your helmets! Don Hatton, renowned Dakar Rally Racer, owner of Duncan Motorsports, and a local Cowichan celebrity has joined forces with the Cowichan Exhibition, as the new venue for their annual Ride for The Way, and “Bikefest 2010” fundraiser for Cowichan United Way! The event, which launched in 2009 is sure to be a real crowd-pleaser for Cowichan Exhibition visitors, and if last year is anything to go by, should bring several hundred bikes, and riders together all raising money to support those in need in our community. The event is on Sunday September 12th, and kicks off with a Pancake Breakfast from 8:00am to 9:30am and then riders and passengers will take a scenic tour of the Cowichan Region touring up through Crofton and Chemainus, to Cedar, through to Yellowpoint and then back down the highway to The Cowichan Exhibition Grounds for a BBQ lunch and plenty of time left over to enjoy all the attractions of the Cowichan Exhibition, with The Midway, Tractor Pull, Vintage Machinery, and Horse Shows and other attractions. As well as an opportunity to meet Don Hatton and hear some of his daring exploits in The Dakar Rally, there will be Vintage Motorcycles, and a Trials demonstration, a 50:50 Draw, and other events. Participants are asked to pay $35 to take part in the Ride for The Way, which includes entrance to the Exhibition, pancake breakfast, event ride with Poker Run, and BBQ lunch. Early registration is encouraged. In fact the first 100 People to PRE- REGISTER will receive a FREE T-Shirt to commemorate the event. Turn 2 Sportbike School is pleased to announce the finalized class structure and schedule for the Turn 2 Moto Club GP Labour Day race weekend presented by Kahuna Powersports. This event is being held at Calabogie Motorsports Park from Sept. 3rd - 5th, 2010. This will be the final event for Turn 2 in the 2010 season. One lucky Moto Club member will go home with the Grand Prize of a 2010 Kawasaki Ninja 250R, full NEXO road-race gear, and many other exciting prizes. The weekend's main race will feature the Superbike class, with primary focus on bikes with 1000cc or greater engine displacement, but will also be open to bikes with smaller engine displacements with unlimited modifications. Qualifying lap times of under 2:20:00 taken from Saturday's heat race will determine Sunday's final grid placement. Prizes for the top three finishers will include up to $3,000 worth of Controlled Riding Group (CRG) track time in 2011. 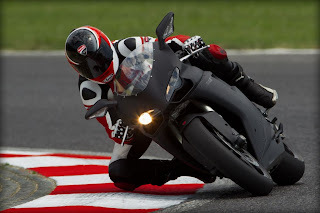 The Supersport class will be limited to bikes with 750cc or smaller engine displacement with unlimited modifications. Qualifying lap times of under 2:30:00 taken from Saturday's heat race will determine Sunday's final grid placement. Prizes for the top three finishers will include up to $3,000 worth of CRG track time in 2011. For inspiring new racers, there will be a Mock Race featuring three sub-classes; Greater than 751cc, 750cc or smaller, and also 400cc or smaller. Qualifying lap times will be determined after Saturday's CRG 2 and CRG 3 sessions. Prizes for the top three in each of these classes will include a 1-day ARC class at any level to be used in the 2011 season. And last but not least, a Best Lap non-race will be open to all Controlled Riding Group 1 participants. "This has been a phenomenal season for us" says Turn 2 president George Budacki. "The sole intent of our race weekend is for pure fun in a club environment, and a great way to give back to the numerous Turn 2 Moto Club members and racing enthusiasts who've supported us in the 2010 season." On Friday September 3rd the school will operate as a normal Turn 2 event with Advanced Riding Course (ARC) and CRG classes available all day at special discount pricing. Racers will be able to practice in the CRG 3 group with coaching available from Turn 2's Professional Superbike Instructors. On Saturday September 4th Turn 2 will operate as normal ARC and CRG days with the exception of dedicated classes for both Superbike and Supersport practice in the morning and Heat Races in the afternoon. On Sunday, the 5th of September, there will be CRG 1 - 3 groups with no ARC sessions available. The format for Superbike and Supersport classes will mirror Saturday's structure, with a Final 25 minute Superbike race scheduled for 2:00 pm, and the Final 25 minute Supersport race scheduled for 3:20 pm. Following Sunday's on-track activities will be an awards ceremony at 5:30 pm, where Turn 2 staff will present prizes to all winners from the weekend. Turn 2 Moto Club members who have worked hard all season in the Super Lap TT Series will finally get the chance to win the Grand Prize draw of a 2010 Kawasaki Ninja 250R and full Nexo gear and accessories. The winner MUST be present to accept the Grand Prize. Early-bird Pre-registration opens Wednesday August 25th at 9 am (Eastern Standard Time) sharp and closes on Friday August 27th at 9 pm (EST). Early-birds will enjoy discounted entry fees for SUPERBIKE and SUPERSPORT classes, as well as grid positions for the Saturday Heat Race which will be assigned on a FIRST COME FIRST SERVE basis. For complete details on the class structures, weekend schedule and entry fees please visit Turn 2 online at www.turn2.ca. Turn 2 Sportbike School would like to thank all their staff, business partners, sponsors, volunteers and most of all the riders who have joined them throughout the 2010 season. Jeff over at VrideTV just let us know he's has released a new HD video taken while on a ride on the Icefields Parkway at sunset alongside the Athabasca River in Jasper National Park, Alberta Canada. A family of mountain goats is featured in this high definition video. He's been getting a lot of traffic on the video - and a putting a lot of miles on his Harley Davidson V-Rod too! 92,623 kilometers! He drove it across Canada and back. And a little more I think judging from that odometer reading. Many of those kilometers have been captured on film. Be sure to visit http://www.vridetv.com/ to see all their great video's. Zero Motorcycles announced the expansion of its Canadian sales and marketing operations with the addition of Mitchell Cycle in Mitchell, Ontario. Local residents in the Mitchell, Ontario area who have been waiting to experience the design and technology that has made Zero Motorcycles the global leader in electric motorcycles will now have more opportunities to demo Zero’s 2010 MX and DS (Dual Sport) models. Built from the ground up using Zero Motorcycles' proprietary Z-Force power pack and aircraft grade alloy frame, Zero Motorcycles achieves an industry leading power-to-weight ratio that increases range and maneuverability. Each model combines state-of-the-art Z-Force™ technology with an ultra-light frame design, making them agile and fast where it counts the most. Instant acceleration and lightweight design enables Zero Motorcycles to take on anything from city streets, to off-road trails, combining exhilaration with efficiency. KTM is showing off a video on YouTube in advance of the European launch of their 125 Naked bike. It's the first of a new range of 125 to 350 cc entry level street bikes planned by KTM. They've also launched a dedicated Facebook page. Looks great in the video but I'm holding out for the 350. I'd love to see a 350 from KTM hit Canadian streets! The bikes engine is said to have been 100% developed in Mattighofen. It pumps out 15 hp which is not likely powerful enough for highway speeds - or at least sustained highway speeds. A KTM sporting a 350 CC engine would seem like a good fit for the Canadian market. Suzuki's UK site is showing off a new Xpedition (XP) variant of the popular V-Strom. This Strom is based on the standard ABS-equipped 650 V-Strom, but includes a number of accessories to make it more "adventure tourer" capable. Suzuki describes it as their new flagship model. 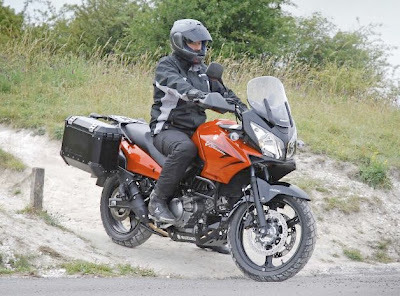 It comes equipped with black aluminum panniers with a total capacity of 82 liters (21.7 gallons), engine and hand guards, an aluminum sump guard, and a center stand. No word on whether this model will come to other markets but it doesn't appear to be anything you couldn't build yourself with a few aftermarket parts. World Enduro Canada and Wiesner Insurance would like to congratulate all our Champions from the Ontario Cross Country Championship Spring Series. The number one plates will be handed out this weekend in Wingham at the first round in our Fall Series. We are looking forward to seeing everyone there - for more information on this weekend's - event check out the link HERE. I was attending a motorcycle show and came across a vendor selling some kind of interesting high-visibility clothing that could be used by motorcyclists that I thought I'd pass along. It's a company called LED-Wear. They're website is LEDWear.ca and the person I spoke with was from Halifax, Nova Scotia. They're website indicates that they're the Canadian and US distributor for the products. I don't know that the event that I went to was the best forum for the company as I heard a few folks kind of joking that they'd look like aliens on the road if they were wearing that sort of outfit. I think that if some well placed LED lighting helps makes you more noticeable on the road then that's a good idea. I would be curious to know about any legal implications of wearing blinking LED vests and such on Canadian roads though. Might have to look into that! Or send off an email to the company. Just in case you missed the horribly kept secret - it's official. Valentino Rossi is moving from Yamaha and will ride a Ducati next year. 31-year-old Rossi, a winner of nine motorcycling world titles in all, created rumours of a departure from Yamaha by entering into the last year of his contract without a new deal. The Italian rider has been a dominant force in MotoGP for many years and the move to Ducati will bring new challenges for him. No doubt Yamaha isn't overly joyed to see him leave the Yamaha tent because even if he isn't winning he's one of the biggest names in MotoGP and brings a ton of attention to the brand that he's riding. Ducati on the other hand is beaming with the news that they've got Rossi lined up for next year. "We are delighted that Valentino Rossi will be with us from 2011. He is a paragon of excellence in the world of motorcycling," Ducati Motor Holding president Gabriele Del Torchio said in a statement. Is Buell returning with a street bike? Is Erik Buell ready to return to the streets once his contractual obligations are lifted and he's once again allowed to compete with Harley Davidson again? If Internet rumor and a recently surfaced video are to believed, he may be readier than you might think. A video showing a Buell 11900RR race bike fitted with indicators and cooling fan have been fueling rumors of a return of Erik Buell! I hope it happens! Scooter Sense Challenge 2011 - You pick the adventure! You may recall that last season on A Motorcycle Experience, host David Hatch made a side bet with Yamaha “Scooter Sense” host, Bryan Hudgin. Dave bet Bryan that he couldn’t ride his Yamaha BWS125 scooter from Montreal to Toronto - with stops in Ottawa and Kingston along the way - using only a $25.00 gas card, tent and sleeping bag for the 3-day trek. Well Bryan not only accepted the challenge but he also completed the journey in record time with gas money to spare. Bryan wisely used “Scooter Sense” t-shirts to barter for food and lodging was provided by the great outdoors. He was able to camp out on viewer Bruce Haskin’s lawn on the first night while sneaking into a provincial park for the second! In the end, Dave lost the bet and was forced to wear a Yamaha motocross jersey for 7 days straight. Dave has nothing against Yamaha off-road apparel, but he certainly did stand out at a good friend’s wedding! So, as the fall riding season approaches, Dave and Bryan are at it again. Dave wants Bryan to push the envelope and take on another challenge. Will it be a “Northern Lights” ride from Toronto to James Bay? A “Rocky Mountain High” cruise from Vancouver to Calgary? A “Maritime Mayhem” tour of the East Coast? Neither man can decide. Instead they are throwing the challenge out to the loyal Motorcycle Experience TV audience….putting you in the saddle! Do YOU have a great idea for his challenge? We’d like to hear it. Post it here on the Yamaha motorcycle blog under the “Leave a Comment” section! Perhaps you’d like to invite Bryan and the Motorcycle Experience crew to explore your home town or favourite local back roads? It’s completely up to you. Just remember, Bryan must remain safe while executing the challenge. Beyond that, the sky’s the limit! Please send us your suggestions by August 15th. Dave and Bryan will weigh the pros and cons of each submission and decide upon a winner - then they‘ll shake hands and it will be game on! Stay tuned to the Yamaha motorcycle blog at http://motorcycles.yamahablogs.ca for updates on when and where the challenge will take place. Bryan will also be updating to the blog and Yamaha Facebook page as the challenge plays out. Finally, you can watch the tour in it’s entirety on TSN’s A Motorcycle Experience in the spring of 2011. Don’t delay! Get your submissions in before August 15th! We may choose yours! Toronto Motorsport Park in Cayuga, Ontario was site of the fourth round of the Southern Ontario Association of Racing (SOAR) Superbike Series. Rider Michael Bevan was looking to carry the momentum of his two wins from the previous round. With his bike repaired using a stock cylinder head he knew the motor would be slightly down on power, Bevan was confident of another solid result. 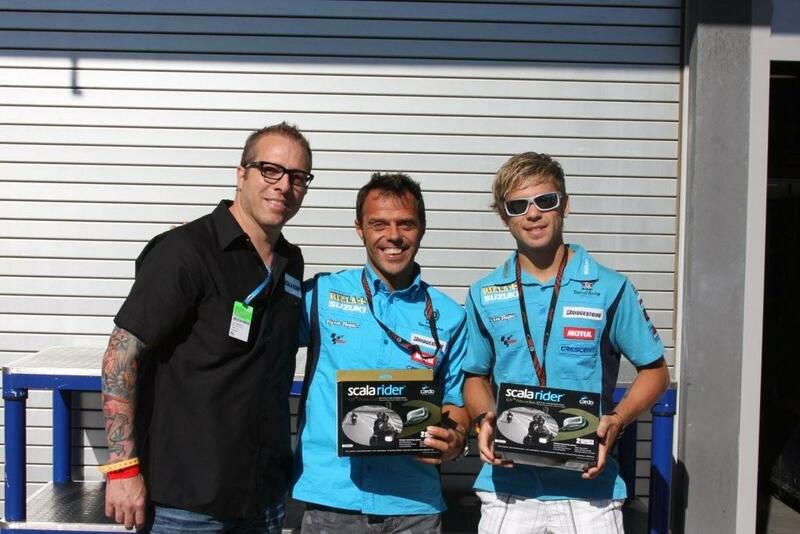 Again he elected to run two classes, Expert 600 and Expert Superbike due to the tight class schedule. With mixed weather conditions throughout the weekend and a green track due to heavy rain fall it made finding the setup somewhat difficult. Running the reverse circuit added another variable. Both rider and machine had to be on top form to ensure a mistake free weekend. The weather stayed sunny and Bevan did not waste any time finding his pace early in Saturday's heat races. The Expert Superbike race saw Bevan run fast consistent lap times earning him the Superbike Pole. In the Expert 600 heat he secured his second pole of the weekend. During the qualifying heats he could feel the bike loosing rear grip, following the heat races he evaluated the rear Pirelli and determined it could hold up for one more race. Sunday morning weather was cool with overcast conditions. In the Expert 600 race Bevan wheelied off the line and found himself lying third. He attacked the second place rider a number of times under braking but rear grip continued to fade through the race making it impossible to get an equal jump off the slower corners as the rider ahead. He was able to capture the final step of the podium with an intelligent ride, and capture crucial points, maintaining his lead in the championship. Prior to the Superbike race Bevan and his crew made some minor changes to the bike to allow for more rear bite off the corners. A fresh Pirelli SC3 rear was mounted for the race. As the skies opened before the race Bevan knew that despite the changes, it would be a challenging race. He was able to get a good launch off the line and take the lead early in the first lap. The rain continued to get heavier and entering the tricky left hander of turn 3 on lap 3 the bike lost grip and shot out from under him ending Bevan's race. Unrelated to the off the race was red flagged due to weather conditions. The race was not restarted and the results were reverted to the last completed lap, Bevan was declared the winner. The result was sweet consolation for the 3rd in the previous race and having his first off since starting racing. It also gave him 15 more points extending his lead in the championship. Discussing the weekend events, Bevan said "It was a challenging weekend. We had the largest Expert grids to date and I am very happy with my results." 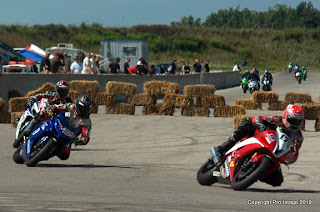 Round 5 of the SOAR Superbike Series rolls off September, 10-12 at Toronto Motorsport Park. Stay tuned for the latest TEAMCMS news and results from TEAMCMS drivers on Facebook (facebook.com/teamcms) and Twitter (twitter.com/teamcms). Team Canada Motorsport (TEAMCMS) is a non-profit organization which fosters opportunity within motorsport through a vibrant community dedicated to the advancement of individuals and the racing industry in Canada. The stated goals of TEAMCMS are to provide strategic assistance to facilitate the success of Canadian individuals in motorsport and reinforce the Canadian Motor Speedway vision of relevance through research and employment for Canadians. To accomplish these goals, TEAMCMS offers memberships to the general public and partnerships to corporations, providing the financial assistance necessary for the development of skill sets and careers. For more information on TEAMCMS and how to become a member contact info@teamcms.ca, or find us on Facebook. Canadian Motor Speedway (CMS) is a proposed $150 million motorsport facility located on an 820ac site in Fort Erie, Ontario. Just 5 miles from the Canada/U.S. boarder and 11 miles from Niagara Falls, the facility has a large market area. The facility will have a 65,000 seat 1-mile, oval speedway, with a FIA/FIM outfield road course connected via an innovative tunnel system. Canadian Motor Speedway will provide world class racing events in a variety of motorsports. The overall Canadian Motor Speedway development will consist of 3 areas, the racetracks, a commercial area and a Research and Development component dedicated to developing improvements and efficiencies in automobile and racecar technology. The unique design was created by the development team consisting of Paxton Waters Architecture, American Structurepoint, maseRace, Emirates Consulting and Jeff Gordon Inc.
Just got a press release from the folks at Joe Rocket Canada congratulating Szoke on all his success this year at the racetrack. 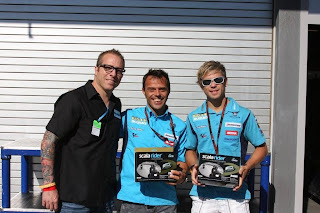 Joe Rocket Canada offers full throttle congratulations to Canadian Superbike and Pro Sportbike Champion Jordan Szoke! On multiple fronts, Rocket Canada racer and Brantford Ontario native Szoke has achieved what no other rider in history has. First, Jordan has won an un-precedented 7 Canadian Superbike Championships. Secondly, culminating with this weekend's race wins at Atlantic Motorsports Park in Schubenacadie, NS, Jordan has ridden a perfect season in 2010, winning every race aboard his Waznie Racing/Joe Rocket Canada/BMC Ciclo Werks/DeWildt Honda Powerhouse CBR1000RR. "Jordan has played an integral role in our racing heritage and continues to represent what the Joe Rocket Canada brand stands for," said Bruce Parker, President of Joe Rocket Canada. "Jordan's recent achievements place him in a league of his own and we're thrilled to ride along with him." Congratulations to Jordan Szoke, his wife Amy, his Dad and Mom, the Fast Company Crew and all of his supporters. Sponsored by Deeley Harley-Davidson Canada, Dave Estok and Olivier Spilborghs represented the Ruthless Racing Inc. team in the final two rounds of the Parts Canada Superbike Series held from August 5 to 8. While Darren James competed in the 2010 British Superbike Championship on a Harley-Davidson XR1200 race bike provided by Warr’s Harley-Davidson, Estok and Spilborghs both fought well in their respective classes in nearly perfect weather conditions in Nova Scotia. Dave Estok came into the final two rounds in fourth place on the Ruthless Racing Inc. Buell 1125R bike in the Pro Sport Bike standings – a mere one point behind rookie sensation Cody Matechuk (Suzuki GSXR 600). The veteran and long-time Ruthless Racing Inc. team member stated third place as his goal for the weekend. “I’ve gotta beat Cody this weekend,” he commented shortly before his qualifying on Friday. “It’s really that simple and I know I can do it. Our times are really close and there are places here where the Buell [bike] is a little better than his bike; well maybe not after that crash.” Estok was referring to a crash he experienced in practice. Ruthless Racing Inc. crew members Rod Matechuk and Dave Oakley rose to the occasion, preparing the Buell 1125R motorcycle quickly for Estok’s qualifying effort. Estok repaid them in turn with a fast lap of 1:10.576, which compared very favourably with his main rival Matechuk’s best time, 1:10.574. Try he did, and he improved. Estok got the start he needed in race two and ran a very strong race, lowering his lap times to 1:09.735 and charging the Buell 1125R motorcycle into sixth place. He was right behind Matechuk at race end, placing fourth in the National Sport Bike Championships for 2010. “I’d like to say I’m happy,” said Estok as the team was packing up, “but fourth place isn’t what I came here for. I mean, hats off to Cody, he had a great year and unfortunately for me he had a great weekend. I kinda feel like I let the team down. I mean, Dave and Rod worked their butts off for me and I didn’t get the results we wanted. I really like riding for the Deeley Harley-Davidson [Canada] team and I’d really like to thank them, and Darren of course, and hope I’m back next year,” he said, smiling. In the K&N Filters Sport Twins Class, Olivier Spilborghs was the only rider with a mathematical chance of catching the runaway points leader, Rob Busby, on the Buell XB12R bike. Spilborghs closed in by one point in his qualifying ride, taking pole position for the National Championships by recording a sizzling 1:12.899 on the Ruthless Racing Inc. Buell XB9R motorcycle. He was the only rider to record a time below 1:13.000. 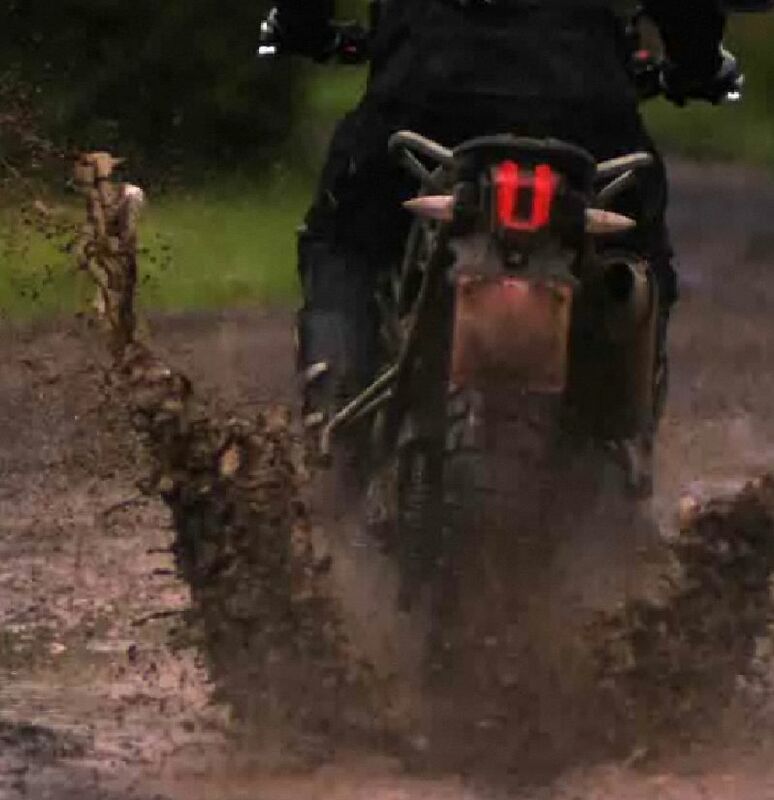 Triumph has been "leaking" photo's and information on their two forthcoming 2011 adventure models - one biased towards pavement going adventures while the other will be a little more off-road capable. Rumor is it will be aimed squarely at taking some share away from the market of BMW's F800 GS. All I can say is - I hope it's awesome! A really great 800cc triple might be a bike I'd be interested in. It'll take something pretty special to get me off my VFR800 though. Follow along via the website they're gradually releasing information to. The link is HERE. BMW Motorrad posted another major increase in sales in July and continued on its growth track. Against the persistent downward trend in the motorcycle segment over 500 cc, BMW Motorrad sales rose by 4.4% to 10,022 (prev. yr. 9,604) units in July. With its young and attractive range of models, BMW Motorrad reported sales growth of 18.5% to 67,037 (prev. 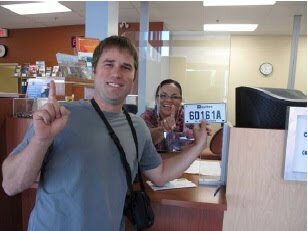 yr. 56,578) vehicles in the year to the end of July. 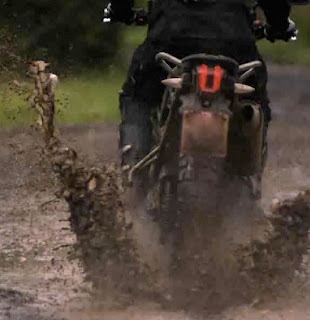 The large long-distance enduro, the BMW R 1200 GS, remains the best-selling model in the BMW motorcycle range. The GS will be celebrating its 30th anniversary this year. It is the most successful BMW motorcycle ever built and has become the world’s best-selling motorcycle in the 500 cc and above range. Ducati North America is proud to announce a sales increase for July in the USA, Canada and Mexico. Motorcycling season is in full swing and Ducati is delighted to report a 7.5% July sales increase over last year in all three North American countries. In the United States alone, Ducati captured a 4.75% increase over July 2009. This is a welcome result for the company in light of continued industry decline. Ducati’s sales success can be attributed to a number of factors, most notably its strong new product lineup. Demand for the Multistrada 1200 continues to exceed supply -- with several colors and packages sold out before arrival stateside. July also marked the arrival of the new Monster 796, a formidable package of lightweight power and agility for $9,995. Further sales strength was found via Ducati’s ‘Unleash the Red’ promotion, the most comprehensive and attractive promotion Ducati has offered to date. Until August 31st customers can choose between competitive finance rates and generous in-store credit with the purchase of specific new Ducati models. August will mark the arrival of the recently announced new 848EVO Superbike, which brings significant performance improvements without a price increase. The ‘Unleash the Red’ promotion and continued arrivals of the new Multistrada 1200 are already ensuring that August will be a repeat of July’s strong sales performance. Lean Angle (leanangle.ca), the exclusive Canadian distributor of the Medical Information Carrier System (MICS) for wearers of motorcycle, automotive, and other powersport helmets, is honoured to announce a campaign to give back to a rider who is being educated to help others. After reading an article in the current issue of Inside Motorcycles by motorcycle journalist John Hopkins, Lean Angle, the Canadian distributor for TechSpec Grip Pads, has learned how one of its sponsored riders, Lee Kuhn Jr. took the time to assist an injured motorcyclist on his way home after a race weekend at Circuit Icar, just north of Montreal. Kuhn, a competitor in the Parts Canada Superbike Championship Amateur 600 Sport Bike class and a student at Trillium College's (Hamilton ON) Paramedic program, was flagged down by a fellow racer shortly after leaving the racetrack. Upon arriving at the scene, Kuhn discovered that a race enthusiast leaving the same track had apparently high-sided his motorcycle over the guardrail. The Hamilton-based racer's training kicked in - Kuhn immediately grabbed the first-aid kit and assessed the situation. When he saw that untrained bystanders were attempting to remove the downed rider's helmet, he immediately advised them to leave the helmet in place due to the high potential for the rider to be paralyzed by the good samaritans' actions. Lean Angle recently announced they are now the exclusive Canadian distributor of the Medical Information Carrier System (MICS). This system would have informed the non-medical bystanders to NOT remove the helmet and would have provided paramedics and other trained emergency personnel with life-saving information about the rider's identity and medical history. "The MICS helmet safety system was developed to assist trained first responders in this exact situation," says Steve Reed, President of Lean Angle. "Lee's training, specifically the helmet removal course he took as part of his Paramedicine program, was instrumental in ensuring that this rider was not subject to further injuries by well-meaning bystanders." Lean Angle was inspired by Kuhn's desire to assist those in need - not only on that day, but in the future - through his decision to become a Paramedic. Lean Angle is proud to announce that for the months of August, September and October, $1.00 of each $2.99 MICS helmet system sold through its website www.LeanAngle.ca will be donated to assist with Kuhn's tuition. Additional opportunities to support Kuhn through the purchase of the MICS helmet system are available in Kuhn's paddock at the upcoming Parts Canada Superbike Championship at Atlantic Motorsport Park, Shubenacadie, Nova Scotia on August 6-8, 2010. "The motorcycling community and racers have a long history of reaching out to those in need and Lean Angle is proud to be a member of this caring group of people. Lee is not only a driven and dedicated competitor, he has also been a great ambassador for TechSpec Gripster Grip Pads, his other sponsors, and the sport as a whole. We are proud to be associated with Lee and the entire Kuhn family and we wish to do our small part to recognize his efforts on and off the track and to ensure he can fulfill his dream of becoming a paramedic." states Reed. The Medical Information Carrier System (MICS) for helmets is currently available online at www.leanangle.ca and at an ever-growing network of dealers and online powersport accessory retailers across Canada. 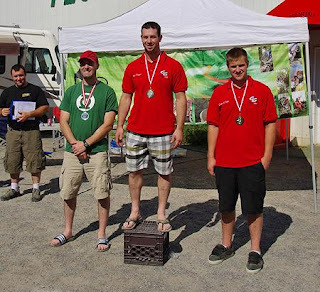 The last 2 rounds of the 2010 Wiesner Insurance Canadian Trials Championship took place in Deschambault, QC last weekend. The riding conditions were perfect, sunny and dry on both days. 41 riders from across Canada (Ontario, Quebec and BC) attended the event making it a true National Championship. In the «Expert» class Paul-Yvan Bélanger took first place ahead of Hugo Piché (QC). In «Advanced» this time John Purse was ahead of Daniel Santerre and Michel Bélanger (QC). A big thank you also goes out to the event organizers and thier volunteer staff. Stephan Fotheringham and his team did an outstanding job in preparing the sections and the interzone. On August 17th, 2010 a cross Canada ride, sponsored by the CF Military Police, will begin at Canadian Forces Base Comox, Vancouver Island, BC, and finish in St John''s Newfoundland,on September 10, 2010. The ride is to raise funds for two charities. First charity is the Military Police Fund for Blind Children (first started in 1962), and the second being the Fund for Wounded Warriors. The ride is not restricted to Military Personnel and anyone can participate. furher information can be accessed on MPNMRR. Ducati has issued a statement to the press regarding recent rumors about Nicky Haden. Regarding the recent allegations attributed to Gabriele Del Torchio - Ducati CEO and President, Ducati states that no agreement has been reached with the riders Valentino Rossi and Nicky Hayden for the future Moto GP season, although our interest in these riders remains. We would like to say that the recent news which has appeared on the US website Cycle World and other websites has been misreported and must be attributed to the many rumors circulating lately. Whether and when an agreement is reached, official press releases will be issued. 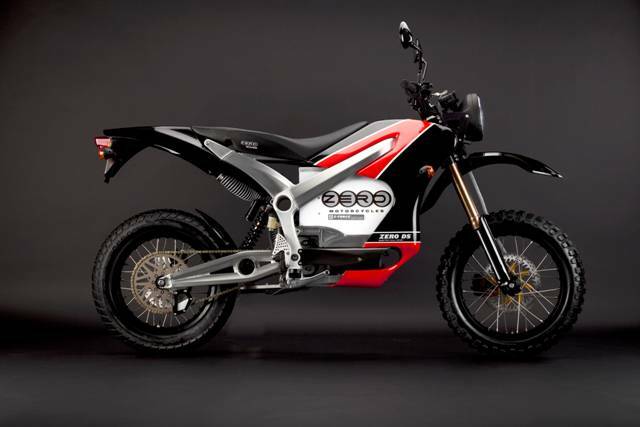 Fresh off the heels of announcing the expansion of its Canadian sales and marketing operations with National Motorsports, Zero Motorcycles is proud to acknowledge its first officially registered electric motorcycle in Quebec. Many Canadians who have been waiting to experience the design and technology that has made Zero Motorcycles the global leader in electric motorcycles will now have more opportunities through National Motorsports and Frédéric Hamel of Mirabel QC is now the first official registrant to do so. Built from the ground up using Zero Motorcycles' proprietary Z-Force power pack and aircraft grade alloy frame, Zero Motorcycles achieves an industry leading power-to-weight ratio that increases range and maneuverability. 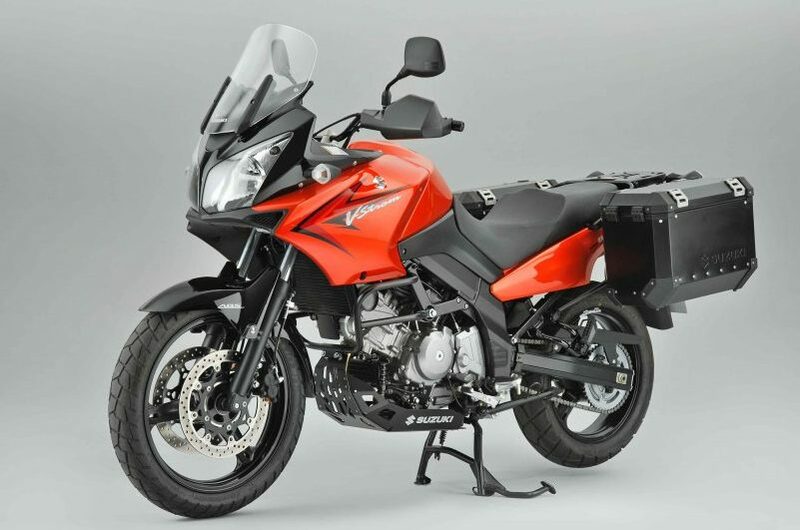 The Zero S and DS have a range of up to 80 km., and a GPS verified top speed of 107 km/h. Each model combines state-of-the-art Z-Force™ technology with an ultra-light frame design, making them agile and fast where it counts the most. Instant acceleration and lightweight design enables Zero Motorcycles to take on anything from city streets, to off-road trails, combining exhilaration with efficiency. BMW Motorrad’s earnings increased sharply in the second quarter on the back of a good sales volume performance despite otherwise unfavourable business conditions. Six-month segment revenues rose by 30.7% to euro 439 million (2009: euro 336 million). EBIT for the period rose to euro 54 million (2009: euro 26 million) and the result before tax improved to euro 53 million (2009: euro 24 million). Six-month revenues increased to euro 790 million (2009: euro 626 million/+26.2%). The segment reported an EBIT for the first half of the year of euro 86 million (2009: euro 54 million) and a profit before tax of euro 83 million (2009: euro 50 million). Sales of BMW brand motorcycles in the second quarter increased by 21.6% to 36,175 units (2009: 29,742 units). During the first half of the year, BMW Motorrad sold 57,015 units (2009: 46,974 units). This corresponds to an increase of 21.4%. The best-seller list was headed by the large, long-distance enduro R 1200 GS, making it the best-sold bike in the 500 cc plus motorcycles segment worldwide. Sales of the S 1000 RR - the first supersport bike manufactured by BMW Motorrad - reached a total of 6,459 units worldwide in the six-month period from January to June (of which 1,223 were sold in June).